GOATWHORE returns less than six months since the release of their critically-adored "Vengeful Ascension" full-length with a new track, "Command To Destroy," available exclusively via Decibel Magazine's renowned Flexi Series. 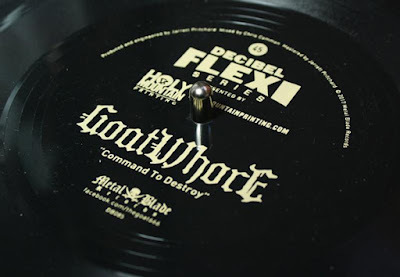 Issues Decibel of the band's latest hymn, "'Command To Destroy' is GOATWHORE at their best, unleashing their signature fusion of black/death/thrash metal." To obtain this exclusive, ultra-limited flexi, become a deluxe Decibel subscriber by Nov. 6 at 9:00 a.m. EST. For further info visit HERE..
GOATWHORE is currently roadbound with 1349 and labelmates Tombs on a short run of live dates leading up to their performance at this year's edition of Ozzfest Meets Knotfest in San Bernardino, California. The journey commenced Oct. 27 and includes three shows supporting Kreator. In February, GOATWHORE will take to the seas on the 2018 edition of 70000 Tons Of Metal, the world's biggest heavy metal cruise before heading overseas for a month-long trek with Sepultura, Obscura, and Fit For An Autopsy. See all confirmed dates below. GOATWHORE is touring in support of latest full-length, Vengeful Ascension, released in June via Metal Blade Records. Their seventh full-length offering and second recorded reel-to-reel, Vengeful Ascension was captured at Earth Analog in Tolono, Illinois with longtime soundman and comrade Jarrett Pritchard (1349, Gruesome). The critically-lauded offering toppled Billboard charts upon its first week of release earning the #4 spot on Billboard's Heatseeker Albums chart, #6 on the Hard Rock Album Sales chart, #11 on the Independent Albums chart, #16 on the Hard Rock Albums chart, #18 on the Rock Album Sales chart, #49 on the Top 200 Current Albums chart, and #59 on the Top 200 Albums chart making it the band's highest charting album to date! In Canada the record was met with equal accolades debuting at #19 on the Hard Music chart and #145 on the Top Albums chart.